This is FinCon week! FinCon is a conference where a bunch of money nerds get together to talk about finances and drink beer, mostly at the same time. This year, the big show is in Orlando. In celebration of FinCon, 1500 Days takes a little diversion this week. Today’s post is meant for attendees. I’ll teach you to make new friends at the conference. Tuesday through Friday, I’ll be featuring other bloggers in the form of my 10 Questions series. And readers, if you’re near Orlando and would like to chat for a spell, give me a shout out. The best part about FinCon is the community. As great as the conference is, it doesn’t even last one week. Therefore, your mission in Orlando is to get lasting value by making new friends (aka networking). Hey, me too. If you meet me and I seem extroverted, I’m putting on a really good act! Coming out of your shell is going to take some work, but trust me, it will be worth it. To help you out, I present to you my best tips for becoming a FinCon extrovert. May I buy you a coffee tomorrow morning? It sure is humid in Orlando, eh? I read your article about saving on travel hacking and really appreciated it! Your new friend will be impressed and the conversation will be much more productive. Imagine that you’re walking through the FinCon hotel and you see two other attendees; one is wearing a scowl and the other is sporting a huge smile. Which one is more approachable? The smiling one of course! Happiness reduces intimidation and invites conversation. Turn that frown upside down! Ask others what you can do to help them. I encourage you to try this out. When you meet someone, ask them what you can do for them. I’ve practiced this ever since and folks are genuinely grateful for the gesture. It’s also led to some wonderful collaboration. Of course you want to have a deep conversation with Mr. Money Mustache, Pat Flynn, and J. Money. So does everyone else! Don’t be afraid to say “Hi!” to your favorite blogging superstar (I guarantee that they are all nice people), but be respectful of their time. A better strategy is to talk to people with audiences that are similar in size to your own. Tip 5: Talk To Me! Introverts unite! Let’s get through this thing together! I need all of the help that I can get. If you see a goofy looking guy wearing shirts with dinosaurs (and carrying plastic dinosaurs), come up and have a chat. Unlike the dinosaurs, I won’t bite. 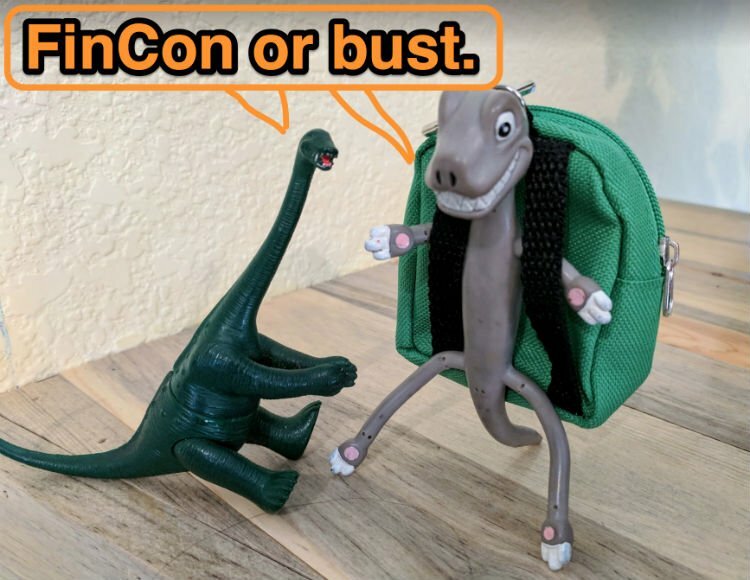 FinCon is a wonderful conference, but to get the most out of it, you’re going to have to come out of your shell. My mission for you is to make three new friends in Orlando. When the conference is over, follow up. Some of our best work happens when we leverage the strengths of others. Now tell me, what can I do to help you? Not coming to Orlando this year. I’m a bit bummed, to be honest. There’s introverts and then there’s introverts. Dyed in the wool introverts. Count me among the introverts! 😉 Great tips, but talking to people is really hard. Almost impossibly hard. Unfortunately (or maybe it’s fortunately?) I won’t be going to fincon this year. Too big an expense for my blogging hobby! Very timely article Mr. 1500! I’ll be attending my very first FinCon in 2 days! Woot! Look me up when you get into town! Oh man. I really wish I could join in the fun! I’ll have to save it for next year. Enjoy and I look forward to the post-FinCon reports! Thanks for the tips. Really enjoyed your posts. For me just reading the title was enough to have a mini heart attack. I think i will stick to observing from afar. Maybe next year.